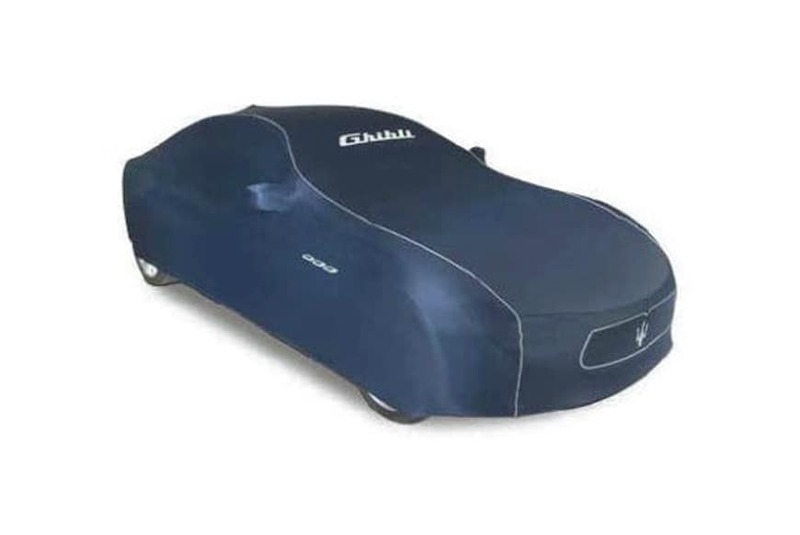 The Indoor Car Cover, specially designed for the Ghibli, highlights the elegant shapes of the car body, perfectly enveloping it. Tailor-made using a high-quality antiladdering fabric in Maserati blue colour, the cover is enriched with light-grey piping and special details picking-up on the car look, such as the front radiator grille and the three side air vents. The “Ghibli” and “Maserati” logos add to the windscreen and boot area finishes. 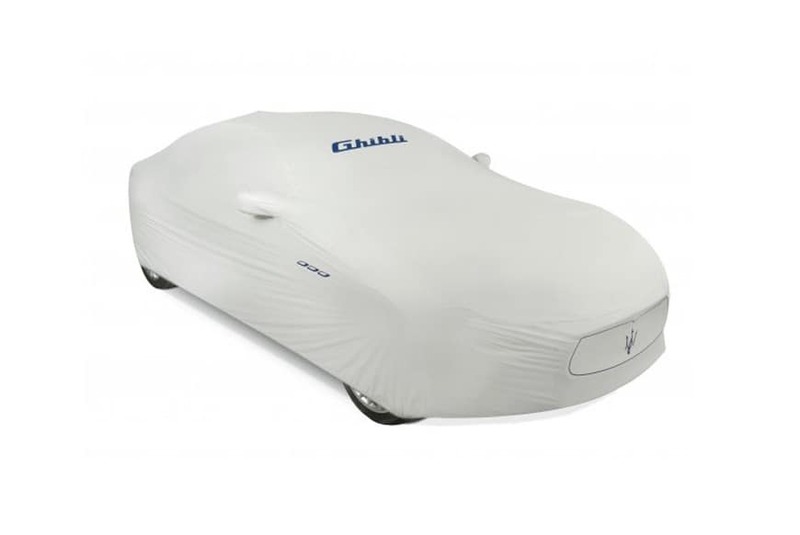 The Outdoor Car Cover provides real protection to the Ghibli from dust, scratches and the effects of the weather. The use of high-performance fabric makes the cover waterproof, breathable and stretchable: this eliminates the wind effects, to provide a perfect fit under any conditions. The light-grey cover is branded with Maserati blue printed details: the characteristic radiator grille with the Trident in the centre, the “Ghibli” logo on the windscreen, the “Maserati” name written on the boot, and the three air vents on the sides. The high-quality materials that make up the Ghibli, from the interiors to the smart exterior details, require specific products to protect them in the best possible way. 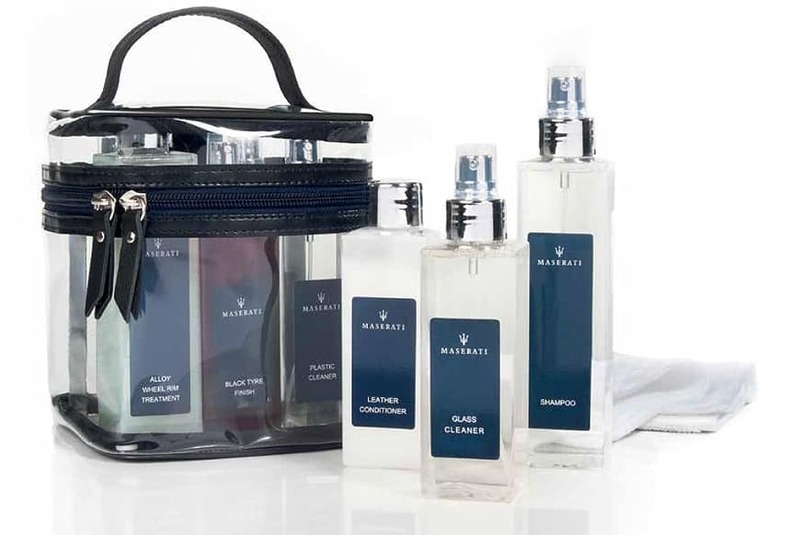 The Car Care Kit created for the Maserati sedan comes in a smart and practical transparent case with leather details. All the products are tested and approved by Maserati’s laboratories and are part of the “Kyoto Friendly” line, making them a perfect balance between quality and respect for the environment. 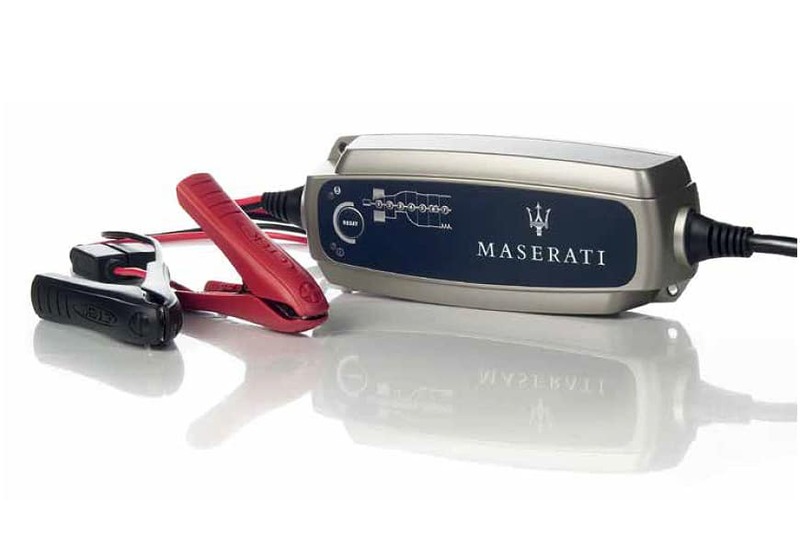 A compact and simple-to-use device, the Ghibli Battery Charger and Conditioner keeps the charge level of your car battery in optimal condition between 95 and 100% and, when required, charges it. The device does not need to be programmed: just connect the car battery to a standard power socket, and you may leave it connected for several months without any risk of damage to the vehicle. The All Seasons Floor Mats are made of black rubber and perfectly follow the shape of the car floor, providing the greatest protection against water, snow, mud or sand. The water-repellent surface allows the driver to safely and efficiently control the pedal board. The kit consists of two front and two rear floor mats, all equipped with a clip to properly fasten them to the vehicle mat and provide the greatest stability. 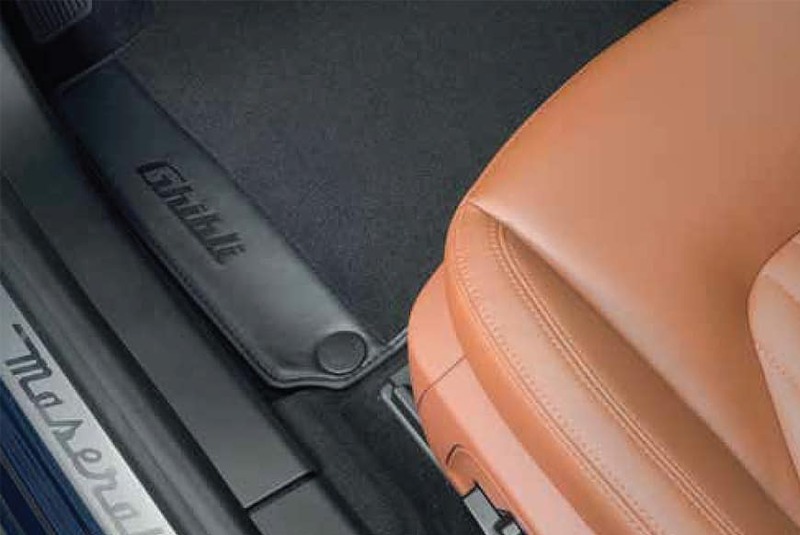 The Branded Floor Mats, tailor-made for the Ghibli, make the most of the car interiors. Available in a variety of colours to complement the leather upholstery, the mats are trimmed with an eco-leather edging in matching tone. 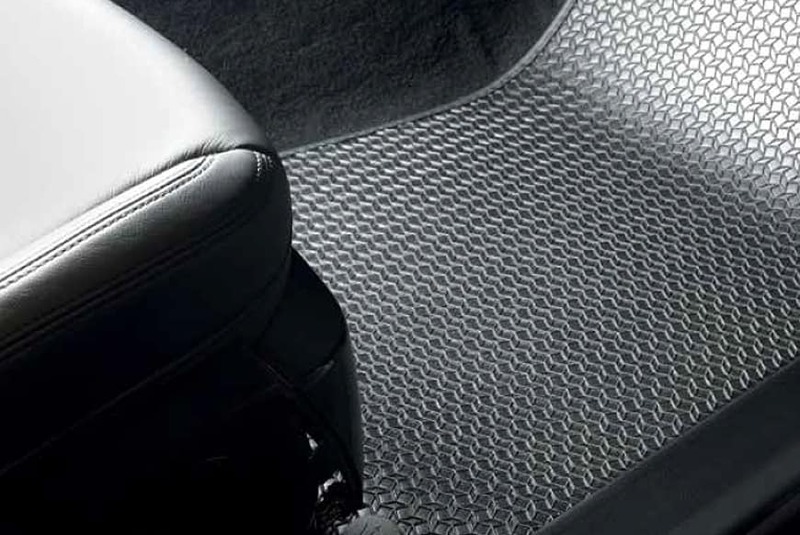 The driver’s floor mat is further enriched with a side insert where the car logo is finely embroidered. 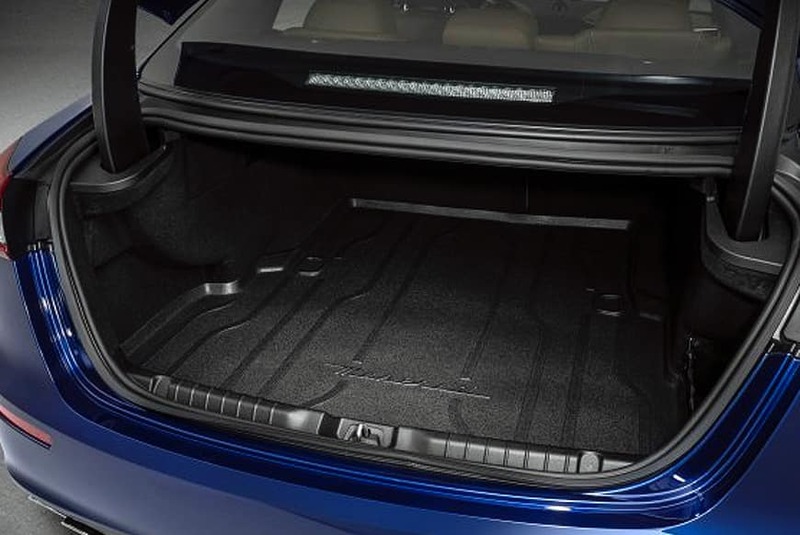 Special anchorage points keep the mats in place and make them easy to fit. The kit includes two front and two rear floor mats. The practical Foldable Box is the ideal solution for keeping small and mediumsized objects tidy, and to avoid losing anything inside the luggage compartment. Another example of classic Maserati design, the box can be easily secured using the Velcro strip on its base and rear, whilst when folded it can also be used as a stylish and convenient briefcase with a front pocket to carry documents, a tablet etc. A stylish and practical accessory to fully exploit the luggage compartment. 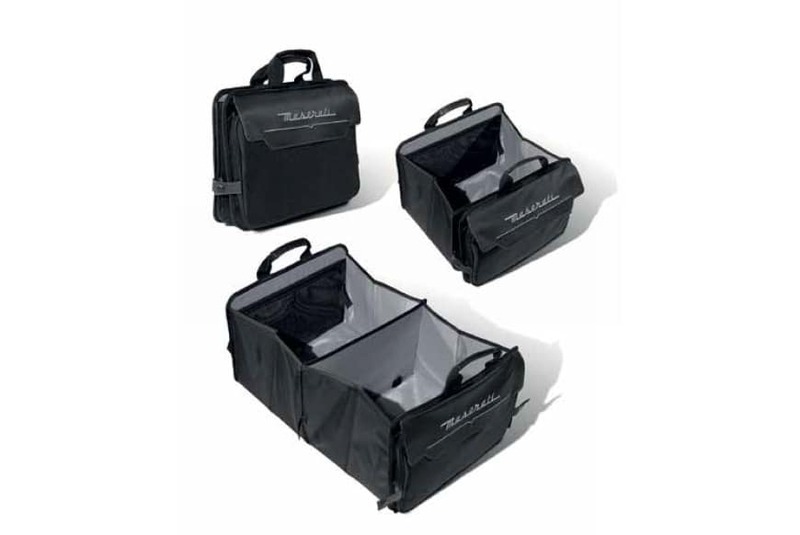 The Luggage Compartment Mat comes in a waterproof, washable and highly resistant material. It perfectly follows the shape of the luggage compartment so as to exploit all of its space, and has finely trim finishes.